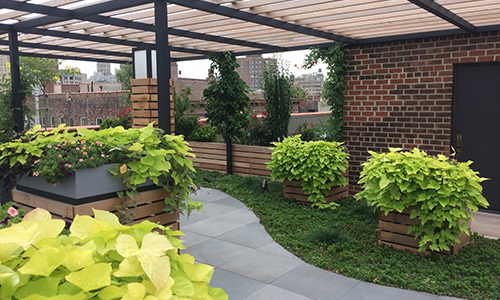 Columbia Green Technologies provides the best green roof or amenity deck system for your project, not a one-size-fits-all approach. Our systems maximize plant health, stormwater retention and drainage for a beautiful finished product long term. WATCH HERE the latest drone footage of our Empire Outlet green roof project!! The green roof will be 2.5-acres once completed. Why install a green roof? Green roofs, also known as eco-roofs or vegetated roofs, are increasingly common. They are known as a great way to make a bleak space aesthetically pleasing and increase property demand and value. However, there are other benefits that come from the implementation of green roofs. The largest impact that green roofs have is on stormwater management. Continued expansion of urban development throughout the world has resulted in increasing amounts of impervious (hard) surfaces. These impervious surfaces decrease both infiltration and evaporative water loss from soils and plant surfaces due to the removal of native vegetation and natural ecosystems. In addition, pollutants deposited on these surfaces run off into our rivers and streams; further degrading water quality and surrounding natural habitats. Columbia Green’s products significantly decrease stormwater runoff, while also creating more energy efficient and sustainable buildings. Green buildings and green roofs are increasingly viewed as a solution to help mitigate the threats and concerns surrounding climate change, water quality and the expanding gap that exists in energy supply and demand. The application of a green roof can help to reduce energy costs related to heating and cooling through their insulating effects, providing the building owner with year round energy savings. Green roofs that are combined with solar panels have also been shown to produce even greater energy benefits due to increased panel efficacy that help contribute to lower a building’s overall energy consumption and environmental footprint. The concept of urban heat island effect is gaining more attention throughout the U.S. and as a result there is more pressure to more directly address this issue and mitigate its effects. Generally, urban heat island describes a buildup of atmospheric gases, usually in a metropolitan area, that is hotter than the surrounding rural areas. This occurrence can affect communities and cities by increasing energy demands in summer months: increasing air conditioning costs, and heightening the occurrence of heat-related illness and fatalities. Green roofs can play an integral role in mitigating those negative effects through the ability to lessen the amount of gases that warm the atmosphere and therefore cool the surrounding environment. Developers and design professionals are also increasingly looking to green roofs for the benefits they provide as a way to create more sustainable green buildings, with lower carbon footprints and a greater ability to manage stormwater runoff. These benefits also extend to the building owner through increased building aesthetics and a potentially higher LEED Certification rating. 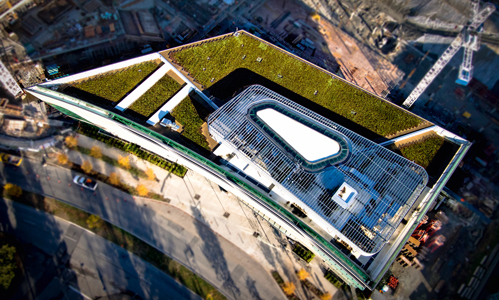 The application of a green roof helps to contribute from 6 to 14 LEED points for sustainable building structures, while buildings with white membranes alone, qualify for only 1 to 2 LEED points. Buildings with green roofs also help to extend the life of the roofing membrane; up to 2 times in many cases. This lowers replacement and repair cost to a building owner, thus reducing direct capital investments. The green roof industry is continually growing and further benefits continue to develop as groups within the green building community push the envelope as to what this technology can provide. Green roofs are also seeing support from governments across the globe. Governments worldwide have begun to adopt strategies of incentivizing green initiatives and enforcing minimum standards that support the development of green buildings. Some incentives available for installing a green roof system include: tax incentives, zoning expansions and direct public utility rebates/monthly billing reductions. Vanessa has a dynamic 9-year global career reflecting optimal performance in the public and private sector in the area of business development, marketing and sales. Vanessa has served in numerous executive positions in business development roles, where she has managed rapid growth; both domestically and internationally. She has been responsible for triple digit increase within the companies she has worked for where she has played a leading role in the sales groups. Vanessa is currently President & CEO of Columbia Green, whose core technologies in eco-roofs are based on sustainable functions that help manage the quality and quantity of storm water, energy use, as well as air and water pollution. Vanessa purchased the company along with local investors in 2009 and Columbia Green is currently experiencing significant growth under her leadership. Ms. Keitges graduated from Oregon State University earning a B.A. in Philosophy. Her personal interests include: riding horses, traveling and meeting new people. She has an affinity toward kids and animals and sits on the Oregon Zoo Wild Life Board. Her true passion is helping others within her community. Vanessa Keitges is President and CEO of Columbia Green Technologies, whose innovative green roofs help manage the quality and quantity of storm water, energy use, and air and water pollution. Vanessa has had a dynamic career in the public and private sector. She has served in numerous executive positions in business development, marketing and sales, where she has managed rapid growth; both domestically and internationally. Vanessa purchased Columbia Green, along with local investors, in 2009 and the company is currently experiencing significant growth under her leadership. In the fall of 2013 Vanessa was appointed to President Obama’s Export Council to represent the interest of small businesses and the green industry. Vanessa was a speaker at SXSW, nominated as top “40 under 40″ executives in Oregon and mentioned as a top woman in technology to invest in 2012 by Forbes eblog. She sits on the Oregon Zoo Wild Life Board. Vanessa graduated from Oregon State University earning a B.A. in Philosophy. Her personal interests include: riding horses, traveling and meeting new people. Greg Love joined Columbia Green in 2010 to assist in the rapid growth and expansion of the firm. As COO, he is responsible for scaling the sales channels, operations, finance and marketing along with assisting the rest the CG team. Greg has over 25 years of experience in leading and growing both private and public high-tech manufacturing companies. Under his leadership and direction these various companies have significantly increased profits and sales. He has done this by implementing various sales and marketing programs and processes. He also developed and hired both executive and mid-management teams along with streamlining their manufacturing processes. To fuel this growth, Greg has raised over $100 million in private funding with both venture and PE firms. Greg’s Northwest experience includes companies such as Micro Power, FLIR and Microscan. Mr. Love earned both a MBA and a Bachelor’s of Science in engineering from Drexel University. Mr. Love is also currently working with a number of early and later stage companies acting as a mentor for the founding CEO. Kevin brings multi-disciplinary teams together to successfully implement green roofs on a national level. His understanding of the ROI for building owners with regards to using green roofs for stormwater management, site conditions for different systems and extensive plant knowledge, provides superior value to our clients by ensuring quality project selection, delivery and installation of green roofs. He is here to help guide and build relationships with Owners, Developers, Architects, Landscape Architects, General Contractors, Roofing Companies and Installers. Kevin is experienced in completing bid substitution forms and presenting them to architects in a professional manner. Kevin is a graduate of Virginia Polytechnic Institute and holds a B.S in Horticulture, with a concentration in Business Management. Kevin also sits on the GRIT (Green Roof Information Think-tank) business development sub-committee, which helps to advance sustainability practices and technology of eco-roofs. His professional and educational background makes him a strong addition to the Columbia Green Technologies team. Robert Littleton brings more than ten years of green roof industry experience to Columbia Green. In his previous position as principal at a green roof installation firm, Robert oversaw estimating and project management, and has a proven track record of successful installations. His extensive hands-on experience enables him to help our customers from the design phase, all the way through the construction process. Robert holds a B.S. in Horticulture from the University of Tennessee. Andrea brings 12 years’ experience as a landscape architect to the Columbia Green team. As Technical Director she is here to answer all your questions related to our green roof systems, and to provide design guidance and product support to specifiers, design professionals, and product installers. Andrea is a registered Landscape Architect with a focus on low impact development and green infrastructure, and is well versed in all phases of project design, construction and maintenance. A Pacific NW native, Andrea earned a Bachelor’s Degree in Landscape Architecture from University of Oregon. She practiced landscape architecture in Portland, with a focus on green design solutions for a diverse range project types and scales. Jordan is the Inside Sales Representative at Columbia Green Technologies and contributes her diverse skill set to the team, along with a strong passion for sustainable development. She brings seven years of construction background, specifically in quality control and material laboratory testing. Jordan works with the national and regional sales team to develop leads, track jobs from project concept to project completion, assist with product specification, and provides overall sales support. A local of Washington’s Columbia Gorge, she attended The Evergreen State College where she received a dual BA/BS in environmental science. Her interests are driven by her appreciation for the environment and people, where she enjoys travelling, all outdoor activities, music, all forms of art, and research. Steve has a background in Civil Engineering and more than 20 years of professional experience in working with general contractors, specialty contractors, designers, and end customers in the construction industry. He has worked across every stage of project development from initial concept through final construction. His experience with Low Impact Design and stormwater management has aided planners and designers all over North America in applying Columbia Green’s green roof technology to meet their goals in building more resilient communities and cities. He is driven by finding ways to apply engineering and design principles to create cost effective solutions to a greener and more efficient built environment. He holds a Bachelor of Science in Civil Engineering from Cornell University. Janelle is the Marketing Coordinator at Columbia Green Technologies and brings thirteen years of experience in executive support and marketing functions. She spent the majority of her career working within the sustainability sector for financial organizations. Prior to joining Columbia Green Technologies in February 2013, Janelle worked as a Marketing Analyst for Equilibrium Capital Group a company focused on building leading investment products and strategies for institutional investors. Janelle assists the Columbia Green team with lead generation, aids in the development of marketing campaigns, coordinates trade shows and oversees our social media accounts. In addition, she supports the Executive Team. Janelle graduated from Southern Oregon University earning a B.S. in Psychology. Her personal interests include: spending time with her family and friends, traveling and cooking. She enjoys helping out her community and currently volunteers with the Ronald McDonald House Charities in Portland, OR. Dan Mongello has a background in Sales and Business Development with more than 10 years of professional experience in working with general contractors, specialty contractors, designers, and end customers in the construction industry. He has worked across every stage of project development from initial concept through final construction. His experience in working with various stages of the process from design to logistics adds a great value. His experience has helped in applying Columbia Green’s green roof technology to meet their goals in building more resilient communities and cities. He is driven by finding ways to penetrate new markets and develop outstanding relationship with contractors, architects, engineers and general contractors while applying principles to create cost effective solutions to a greener and more efficient built environment. He holds a Bachelor of Arts in Business Technology from UMBC. Kevin Goad comes to Columbia Green Technologies with a background in Business Development and Sales with more than 20 years of professional experience in the Environmental, Energy and Sustainability industries. He has worked with building owners across the country to help them reduce their energy and carbon footprints and decrease their overall operating costs. Kevin understands the importance of the return on investments for building owners when it comes to building improvements and the overall value that green roofs bring to the building, the owners, occupants and communities. He is here to help guide and build relationships with Owners, Developers, Architects, Landscape Architects, General Contractors, Roofing Companies and Installers. Kevin is a graduate of the University of Houston and holds a B.S in Environmental Management, with a concentration in Marketing. Kevin also is a member of USGBC and is a LEED Green Associate. His professional and educational background makes him a strong addition to the Columbia Green Technologies team. Landscape Architect: Christian Duvernois Gardens, Inc.